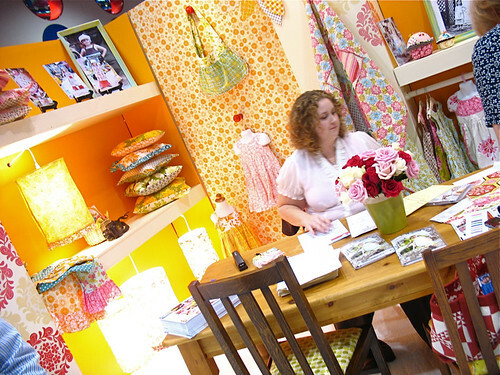 More Quilt Market Fabulousness - Stop staring and start sewing! The winner of yesterday's Sugar Snap fat quarters is Kara (at 10:16 am). Yippy Kara!! My favorite part of Quilt Market is getting together with all of my online friends (and getting to meet some of them in person for the first time!). Sandi Henderson (who I've known for a few years but met "officially"in the spring) had another fabulous booth and it was so nice to touch base with her. Joey spent some time chatting with Sandi's husband Dustin (I'm so grateful for the gals that brought their hubbies!) 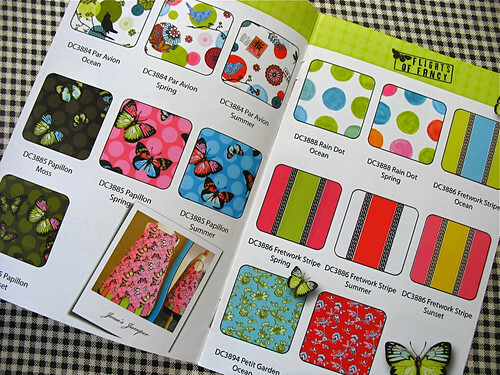 and I ordered some of her gorgeous patterns for the store. Sandi looked so cute and had gorgeous curls. Here's the other corner. I know she's working on some great stuff for spring so keep an eye on her blog! I've known Patty Young for a few years because we both sold boutique clothes on ebay (as did Sandi) so it was an absolute thrill (I mean tingles up the spine and tears in my eyes kind of thrill) to see her debut her stunning new fabric line Andalucia (with Michael Miller). It's really, really gorgeous. Here's Patty sitting in one of her "little" chairs (she and Paula have shown the world that you don't have to be an Amazon woman to create great fabric!). 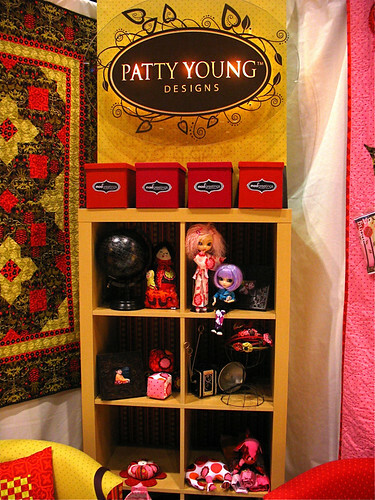 ;) Her booth was beautiful and hard to stay away from. Patty brought her husband Jon (totally nice guy!) which made Joey happy. Myrinda made a super cute kimono for Patty's little doll (see the blonde one on the shelf?). 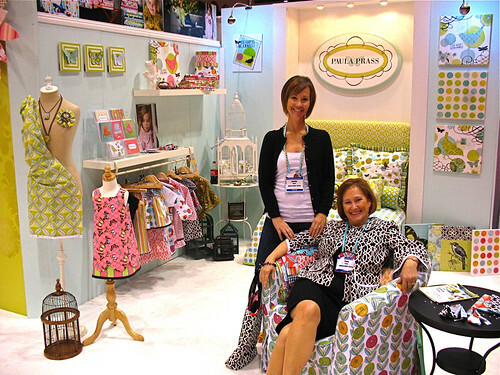 Look at these darling bibs and dresses (the one on the left has a cute hoodie too)! 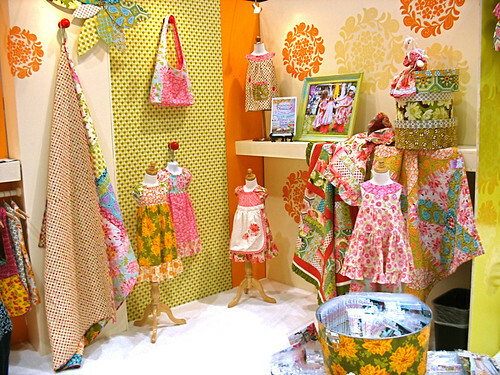 I met Paula Prass at Spring Market and it was so much fun to be at this market for her fabric debut. Flights of Fancy (Michael Miller) is so darn cute and I had the privilege of playing with it a couple of weeks ago. Imagine my delight when I opened up Paula's brochure and saw my dress right there! Thank you Paula! Here are Paula and her daughter Jennifer. They are so nice and so much fun to hang with! We did a lot of chatting at the fabric 2.0 party and if they lived in Arizona they would be my BFFs I'm sure (and yes, they are seriously that cute in person)! See my dress again (tired of it yet?)?! Look at this darling table display! Fortune cookies with the selvages used for the fortune "paper"!! 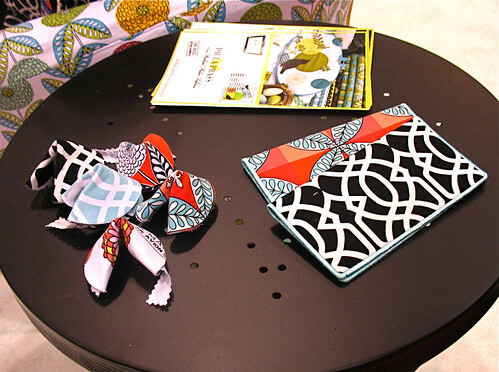 Those are the brilliant work of Traci (as well as those wallets)! Oh and Paula's darling jacket is the work of Mary, who is so much fun and does beautiful work! 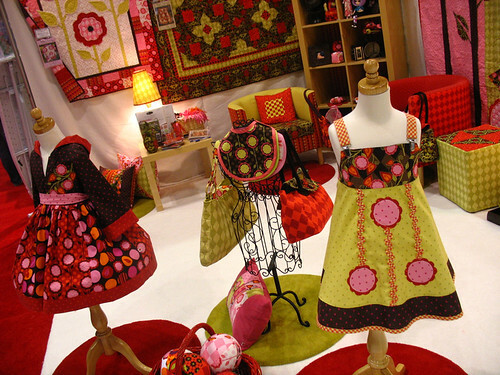 Here's my token quilt for the day (they don't call it Quilt Market for nothin'). 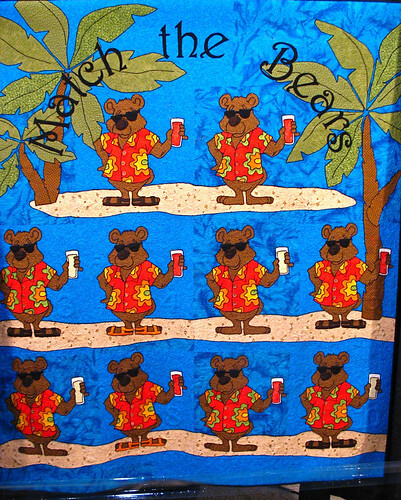 Cute and useful (you can stretch your brain by finding the matching pairs of bears)! Here is another give-away! 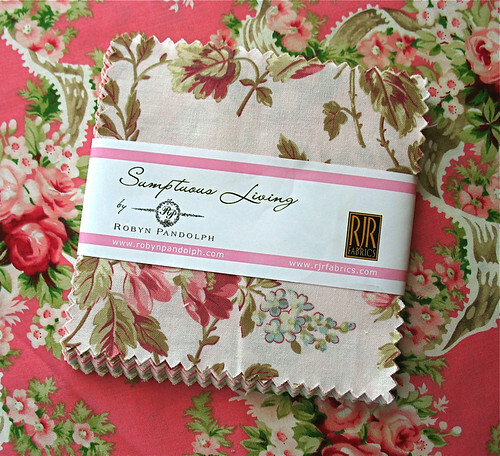 This gorgeous charm pack of Robyn Pandolph's new line called Sumptuous Living. It has 36 squares and this fabric is so soft! Just leave a comment, yada yada....! More tomorrow!